WASHINGTON, DC – Soul legend Gladys Knight took the stage staring into a sea of empty seats. It was three hours before show time, and the VIPs with reserved seats wisely avoided the blistering afternoon sun. Knight, however, was undeterred. “This is a thing we used to call audience participation,” she hollered to the groundlings on the Capitol lawn who arrived hours before to stake a prime spot. Knight drew out each syllable of “par-tic-i-pat-ion” and drew cheers of delight from the exhausted but excited assembly of hundreds. When Knight launched into a call and response, her words were thrown back with force and a smile crossed her face. After a few volleys, the band pumped the final vamp as she threw up her arms and walked from the stage. The 30-minute mini-set, which included a few instrumental runs through made the risk of heat stroke seem reasonable. The blazing sun had been replaced with bright stage lights and television cameras when Knight re-emerged shortly after 8 p.m. After a brief welcome by MC Jimmy Smits, American Idol David Archuleta opened the show with the “Star-Spangled Banner.” Then it was time to get down to business. The Empress of Soul emerged in a golden gown, flying into “Midnight Train to Georgia.” Knight’s voice was strong in the afternoon, but now she sang with even more soul and emotion. The words are the same, but the phrasing was different and they were delivered with a power has been honed over Knight’s half-century career. Her voice rises in sharp contrast to Darius Rucker’s, who also sound checked in the afternoon. I realize his laid-back, what-you-see-is-what-you-get charm is a large part of his appeal, but there was very little difference between the run-through and televised performances. Rucker has a fine voice, but I hope he was paying attention. Barely pausing after “Georgia,” the band hic-cupped into Knight’s 1969 hit “The Nitty Gritty.” Knight used the upbeat number to pay tribute to two of her departed Motown label mates, dropping in a healthy portion of the Jacksons’ “Shake Your Body (Down to the Ground)” and a sample of a Rick James number. Then it was time to finish business with her biggest hit, “I Heard It Through the Grapevine,” which showed no signs of age. And that was it. Ten minutes, three songs, and she was walking offstage. Afterward people started asking me if it was worth it to trek to the Mall so early and broil for so long. Absolutely. Knight’s presence cemented my attendance, but I likely would have gone anyway. As far back as I can remember, my family always gathered around the television on the Fourth of July to watch the PBS broadcast from the capital. And now, with my parents rooting me on from their air-conditioned living room, I was there. The performances I remember from growing up were classical and marching band pieces, so the National Symphony Orchestra’s patriotic overture from “George M.” and classical pianist Lang Lang’s solo adaptation of “Stars and Stripes Forever” resonated the most deeply. Once the shock of hearing Sousa’s most famous number without horns wore off, Lang’s performance was quite profound. The lines typically dominated by trombones and tubas was intricate and dissonant, while the familiar piccolo refrain had a ragtime feel. Although the Capitol lawn is vast, it was easy to forget about the thousands of people standing behind me and the hundreds of thousands gathered behind the stage, on the Mall. In a way, the “Capitol Fourth” broadcast felt like any concert in the park, albeit one with TV cameras and A-list talent. As John Schneider (aka Bo Duke) led a recap celebrating the 30th anniversary of the broadcast, I abandoned the concert grounds and headliner Reba McEntire and to be part of the teeming masses camping around the Washington Monument. The high-profile event disappeared with every step. The lawns on the Mall were filled with tents, displays and crowds oblivious to the concert behind them. Walking through one block I encountered an expanse of grass filled with multi-colored tents bearing signs like “Yoga and Meditation” and “Free Feast.” The tent most intriguing to me featured live traditional Indian music. The artists onstage were nearly obscured by smoke, and the crowd was sparse, but there were more people dancing than watching. A block further, I spotted what I thought to be a poetry slam backed by a live drummer. Upon closer inspection it was a different sort of poet, a fevered evangelist in the middle of a passionate altar call. I briefly raised my hand in solidarity and pressed on. 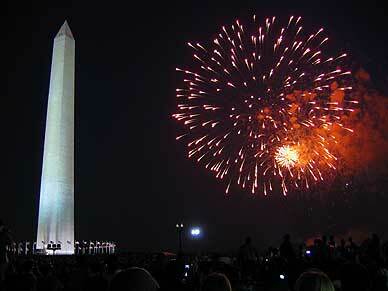 An orange band hovered on the horizon above the Lincoln Memorial when the fireworks started shortly after 9 p.m. 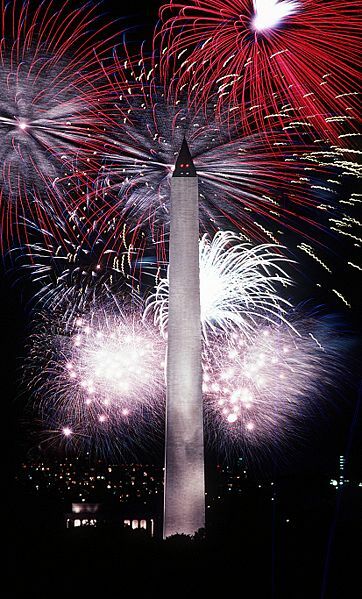 Unlike all previous July 4th celebrations I have attended, the carnival of explosions around the Washington Monument burst without accompaniment. The muffled pops and sizzles from each multi-color detonation was met by the collective oohs and ahs of thousands. In place of orchestration, my ears were treated to a kaleidoscope of accents, dialects and languages, punctuated by the occasional far-off siren or barking vendor. It was one of the rare moments in my life when music was rendered completely redundant. For 20 minutes we stood united by a common gaze in the sky, a diverse collection of tourists from all parts of the map. Although the horde easily exceeded the audience created by the simultaneous emptying of Kauffman and Arrowhead stadiums, the Kansas Speedway and Sprint Center, there was no whiff of anger or danger. Small children danced in front of their strollers as teen-agers texted their friends and old-timers remembered when. It would be poetic to say that when the display ended we all went back to our respective lives, but in reality we all just swarmed to a different location – the subway stations.